Thai cooking places emphasis on lightly prepared dishes with strong aromatic components. 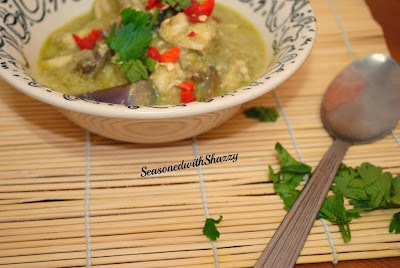 Thai green curry recipe is one of the best I've ever made. 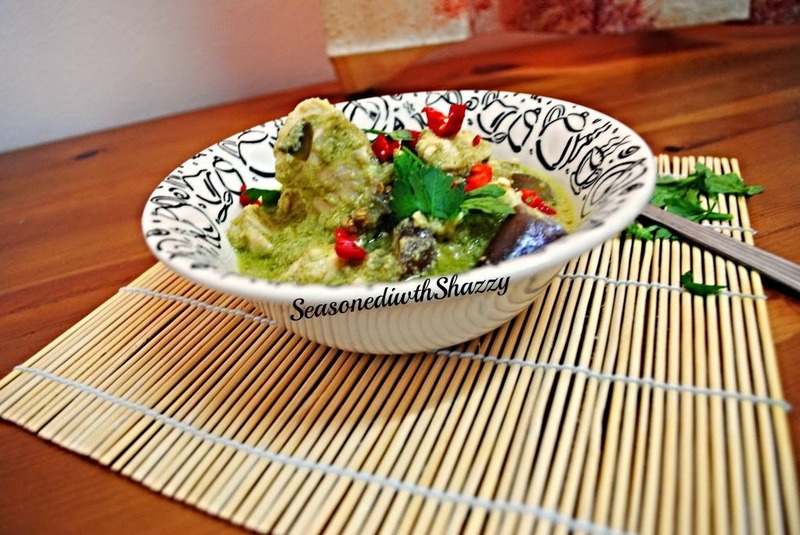 This spicy Thai-style green curry with tender chicken thigh fillets, eggplant. I love Thai-food because of the amazing fragrant. Its just delicious to enjoy when its still hot! • Whiz the rest in a food processor with the lemongrass stalks, spring onions, chillies, garlic, ginger, coriander seeds and lime leaves (if using), until everything is finely chopped. • If you don’t have a food processor, chop everything by hand as finely as you can. Heat the oil in a wok or large frying pan. Add the green curry paste and sugar and cook over a fairly high heat for about a minute, . Reduce the heat slightly and stir in the chicken pieces and lime leaves or zest until coated in the paste. Add the coconut milk, fish sauce or soy sauce and bring to a simmer, cooking for 25-30 minutes until thickened slightly. Stir in the coriander and lime juice. Check for seasoning, adding more fish sauce or soy sauce if needed. The curry is now best left to sit for a few minutes so the sauce becomes creamier. You will also taste the true flavours of the curry paste ingredients when it's slightly cooler. Serve with lots of fragrant Thai jasmine rice. hi shazzy, nice knowing you thru AFF event. YOu right, thai dishes tho simple to prepare, they are really tasty with their widely used ingredients like fish sauce, palm sugar, lime..etc. 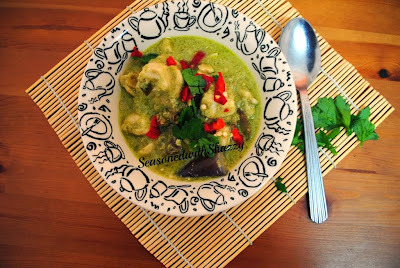 Your green curry must be so delicious, i bet! thanks for your submission to AFF Thai! thanks for dropping by :) nice to meet ya as well..now we all can enjoy delicious Thai food too :)!